Embryo research, cloning, assisted conception, neonatal care, saviour siblings, organ transplants, drug trials - modern developments have transformed the field of medicine almost beyond recognition in recent decades and the law struggles to keep up. 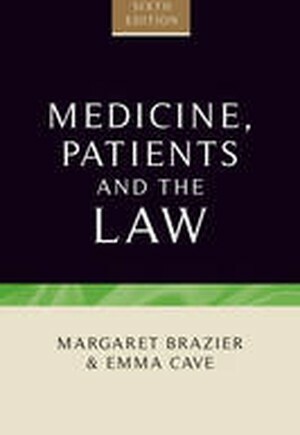 In this highly acclaimed and very accessible book, now in its sixth edition, Margaret Brazier and Emma Cave provide an incisive survey of the legal situation in areas as diverse as fertility treatment, patient consent, assisted dying, malpractice and medical privacy. The book has been fully revised and updated to cover the latest cases, from assisted dying to informed consent; legislative reform of the NHS, professional regulation and redress; European regulations on data protection and clinical trials; and legislation and policy reforms on organ donation, assisted conception and mental capacity. Essential reading for healthcare professionals, lecturers, medical and law students, this book is of relevance to all whose perusal of the daily news causes wonder, hope and consternation at the advances and limitations of medicine, patients and the law. -- .